Apple and Huawei were the only tablet manufacturers reporting sales growth in the most recent quarter. The tablet market worldwide showed a 13.5 percent decline in the second quarter, but Apple has widened its market share lead, according to statistics released Thursday by research firm IDC. Apple, which in its earnings Tuesday reported that it sold 11.5 million iPad units in the quarter compared to 9.1 million the year before, joined Huawei as the only major tablet manufacturers to show growth. Apple, IDC said, was helped by the launch of the new 2018 iPad this past spring, bringing it to 34.9 percent market share, up from 29.9 percent a year ago and maintaining the top spot worldwide. "The launch of a newer iPad towards the end of the first quarter, combined with improvements to the OS and the renewed push into Education, seems to be paying off for the company," the report said. "iPad unit sales grew for the fifth consecutive quarter and we gained significant share of the global tablet market based on the latest estimates from IDC," CFO Luca Maestri said on the earnings call Tuesday. 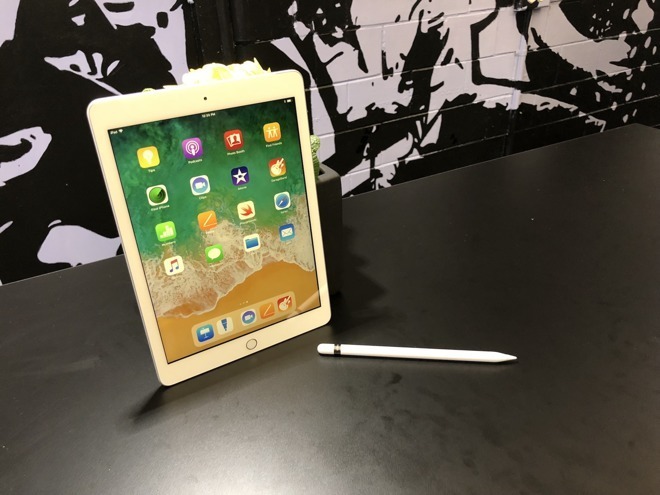 "We recorded double-digit iPad unit growth in both our Greater China and rest of Asia Pacific segments with a new June quarter record for iPad sales in Mainland China. Almost half of iPad purchases in the quarter were by customers new to iPad and our active installed base of iPads reached a new all-time high." 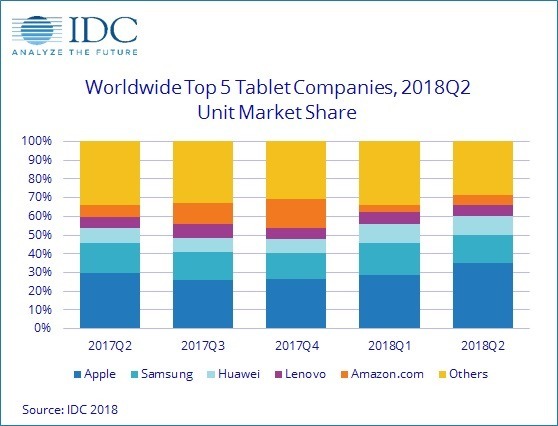 Samsung, despite declining year over year, remains the #2 tablet manufacturer, followed by Huawei, which has a strong position in the Asia/Pacific region. Lenovo is fourth and Amazon fifth. Overall, both the detachable and slate categories declined in the quarter; the detachable category, IDC said, was hurt by high-profile product launches in the second quarter last year and an absence of them this year. "The detachable market is at a crucial stage as it has been driven primarily by premium products from Microsoft and Apple and growth has slowed in recent months," Jitesh Ubrani, senior research analyst with IDC's Worldwide Quarterly Mobile Device Trackers, said in the announcement. "Though consumers and businesses alike have shown interest in the detachable form factor, those operating on tighter budgets have had very few options available to them and hence some have opted for traditional PCs. Going by IDC's definitions, slate tablets, or traditional tablets, are "tablets without a dedicated keyboard." Detachable tablets such as the iPad Pro and Microsoft Surface are meant to work with a keyboard with an attachment like Apple's Smart Connector.